What is a first cousin once removed? (As the joke goes "Can a cousin, once removed, be returned?") Is it the same as a second cousin? The short answer is "No, they're not the same thing." Let's take a look at what those cousin terms mean and how you can figure them out in your family tree. Terms like "first cousin" and "second cousin" refer to what I call the degrees of "cousin-ness." It's an indication of how close the common ancestor is to them. The further back the first common ancestor is, the larger the number. First cousins are as close as you can be and still be cousins. It means that the closest ancestor that two people have in common is a grandparent. (If they were any more closely related, they would be siblings.) "Second cousins" means that the closest common ancestor is a great-grandparent. Third cousins, then, have a great-great-grandparent as their most recent common ancestor. "Removed" refers to how many generations "different" two people are. Their most common ancestor might be the great-grandfather of one and the great-great-grandfather of the other. Since they're not equally distant from the common ancestor, "removed" is a way to show how far apart they are. 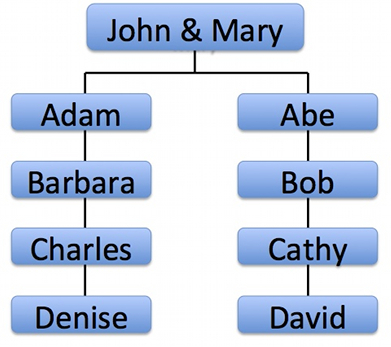 In the example below, John and Mary had two sons: Adam and Abe. Adam had a daughter named Barbara; Barbara had a son Charles; and Charles had a daughter Denise. Abe had a son named Bob; Bob had a daughter Cathy; and Cathy had a son David. Let's see how these people are related. Barbara and Bob are first cousins. Their closest common ancestors are their grandparents (John and Mary). Barbara and Bob have the same distance from their closest common ancestors; no "removed" is necessary. Charles and Cathy are second cousins. Their closest common ancestors are their great-grandparents (John and Mary). They, too, are the same distance away from their closest common ancestors; no "removed" is necessary. Similarly, Denise and David are third cousins. Their closest common ancestors are their great-great-grandparents. They are the same distance apart, so we don't need a "removed." Barbara and Cathy: Their closest ancestors (John and Mary) are Barbara's grandparents, but Cathy's great-grandparents. The one closest determines the "degree." In this case, Barbara is closest. She's a grandchild, so that makes the degree "first cousin." Cathy is one generation different (she's a great-grandchild), so we need to "remove" her once. Barbara and Cathy are first cousins, once removed. Barbara and David are first cousins, twice removed. Barbara is still the closest, at grandchild, so it's still a first cousin. But David is two generations different, so he needs to be "removed" twice. Put it together and you have first cousins, twice removed. What about Charles and David? The closest relationship to the common ancestors is Charles, as a great-grandchild. That makes the "degree" second cousins. But Charles and David are one generation different, so they need to be "removed" once. Their relationship is second cousins, once removed. If you're more mathematically inclined, there is a formula you can use. Take the relationship of the closest ancestor and add 1 to the number of "greats" for the "degrees." For example, if the closest ancestor is a great-grandparent, the degree is second cousins. Add the number of "removed" as necessary.